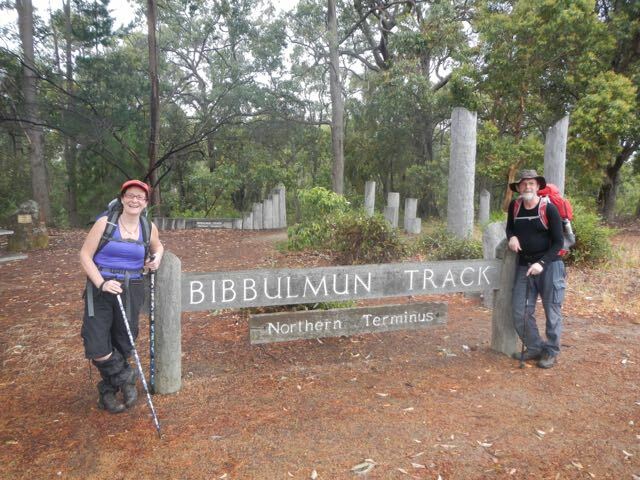 Exactly 5 years after we ventured a couple of hundred Kms down the Bibbulmun track from Perth, we have returned. The plan is to drive coast to coast in a vintage Mazda van, a journey of 5000km over two weeks, hopefully having time out of the driving seat to do some hiking along the way. 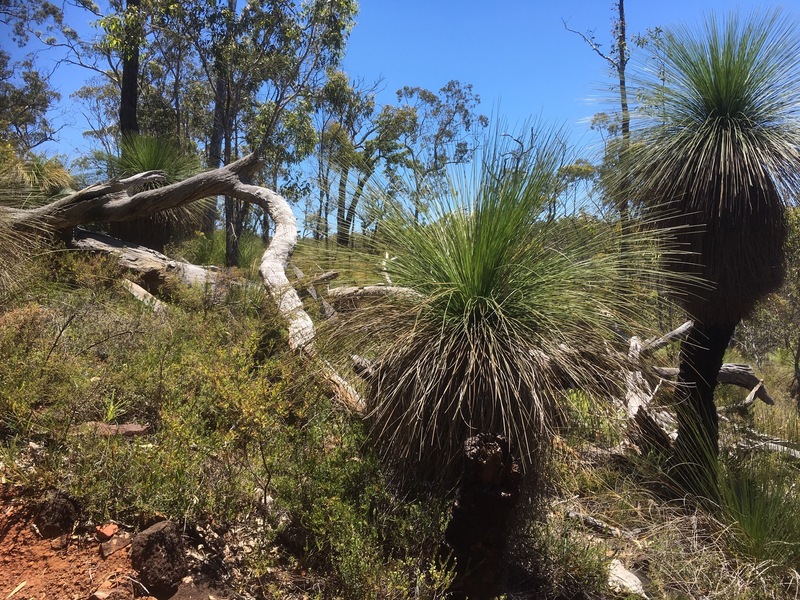 In between searching for a van and recovering from jet lag we had a trip out to the John Forrest National Park just 25km east of the city. 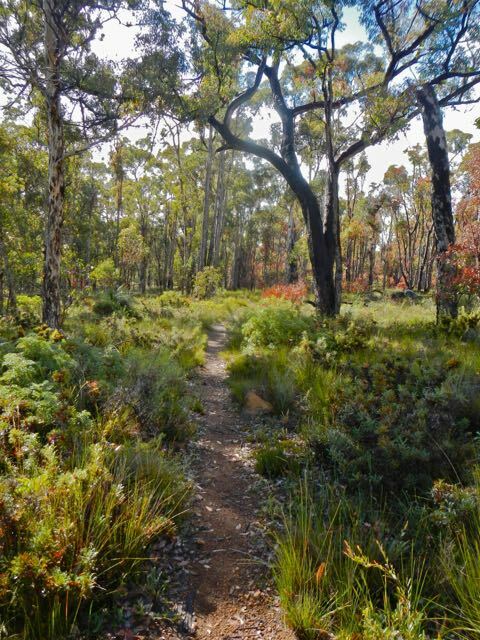 This 2700 hectare park, named after a famous Australian explorer is in the northern Jarrah forest on the crest of the Darling Scarp, the mountain ridge where we started our Bibbulman trek. Being so accessible from the city it’s a popular destination for daytrippers with a number of trails of different lengths,picnic and barbecue areas and even a pub and tea rooms. So civilised. After registering at the Rangers office and a quick look at the Walkers Log we headed off on the longest route, the 15km Eagles View Walk. We passed under one of the three wooden trestle railway bridges in the park that carried the rails of the Eastern Railway, the line built at the end of the 19th century to open up the vast forests for exploitation. Built with hard labour, picks , shovels and horsepower vast amounts of rubble was moved to create embankments which are now used as a trail. 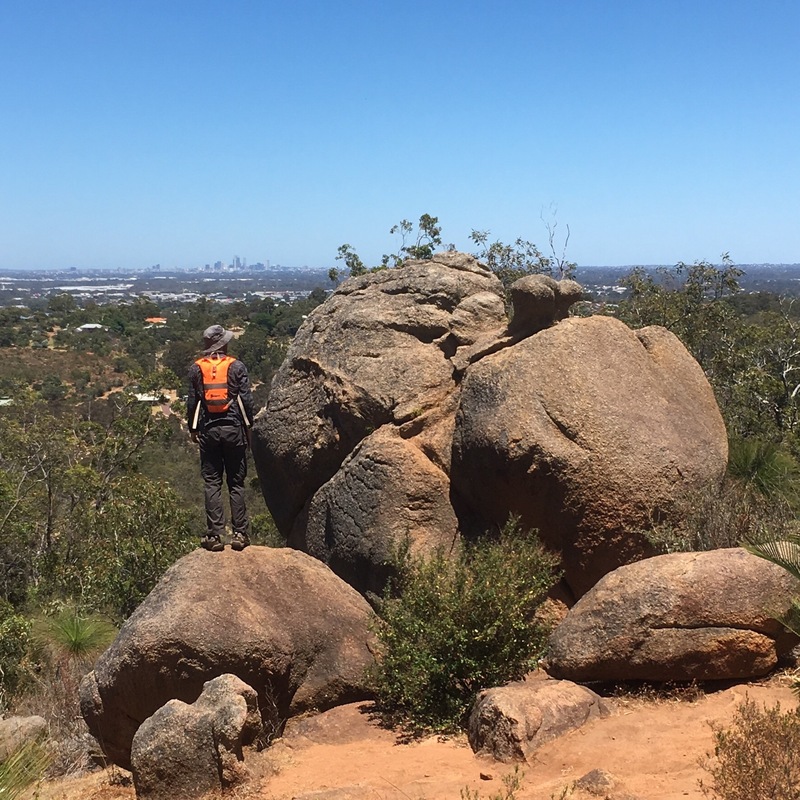 Western Australia’s first tunnel was also blasted and bored here, through unstable granite that kept collapsing, leading to it eventually having to be lined with brick. The 350m tunnel was still not a success though, as the poor ventilation and noxious fumed meant the drivers and firemen were often overcome by the fumes and when one died of carbon monoxide poisoning, an alternative route was opened up. 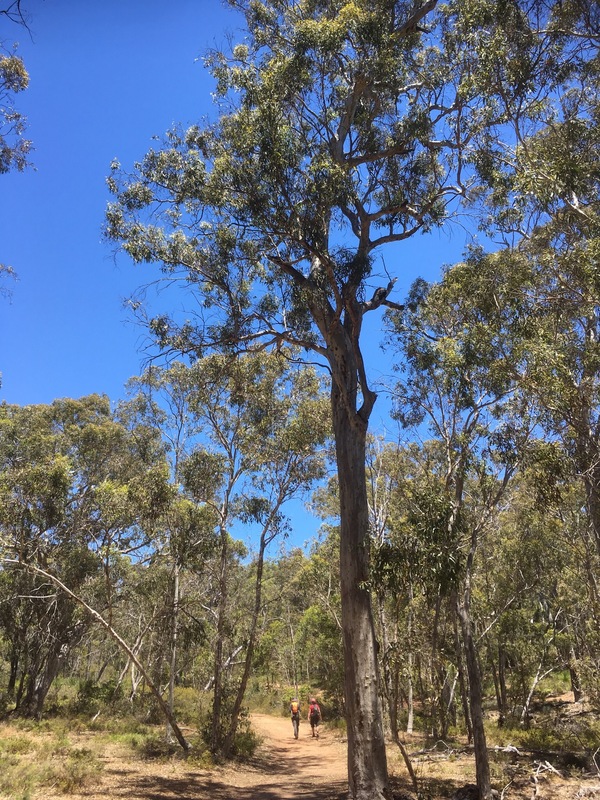 Those days are long gone however and the hot and sultry air was full of a scent that transported us back 5 years to our days hiking through these gum forests. It seems an environment particular to Australia especially under a cobalt blue sky in the shimmering heat of summer. It was a little too hot for us folk fresh off the plane from Ireland and we remembered why we would start our Bibbulmun days in the cool of daybreak around 5am. 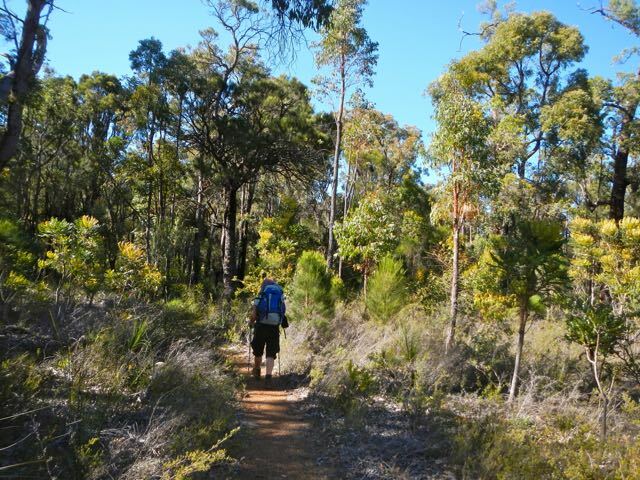 The track makes a circuit through the parks more remote northern half, through a mix of heathland, open wandoo woodlands and forests of jarrah, marri and lord know what. 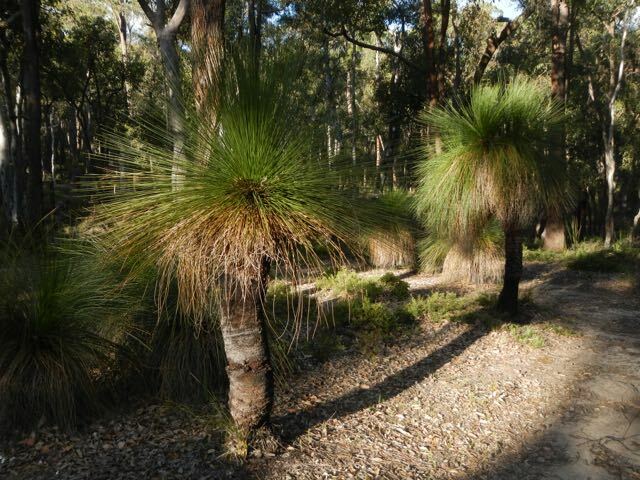 We recognised the big seed heads of Banksia and the familiar grass trees. We didn’t see any wildlife apart from a bunch of Roos hanging around the bar ( literally) and various birds with exotic song. No snakes or spiders, nothing to prevent us falling into a false sense of security. It’s all out there somewhere. we made our way around the man made pond to the safety of the pub. 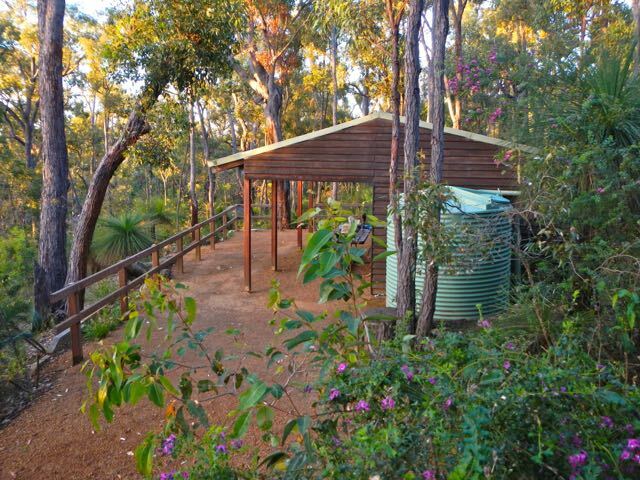 Fancy a few days, weeks, or months in the Bush? 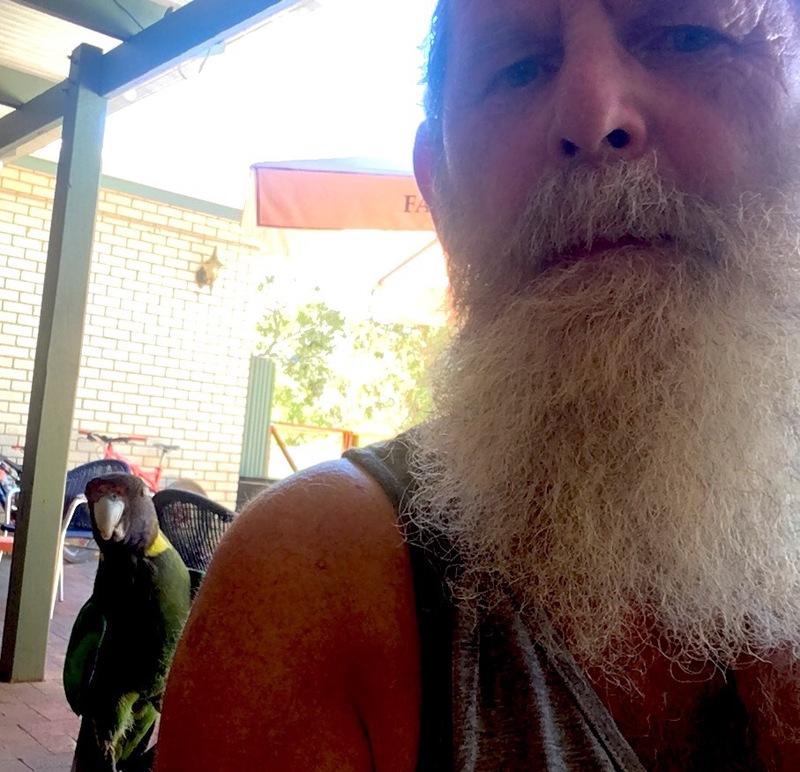 In W.A. 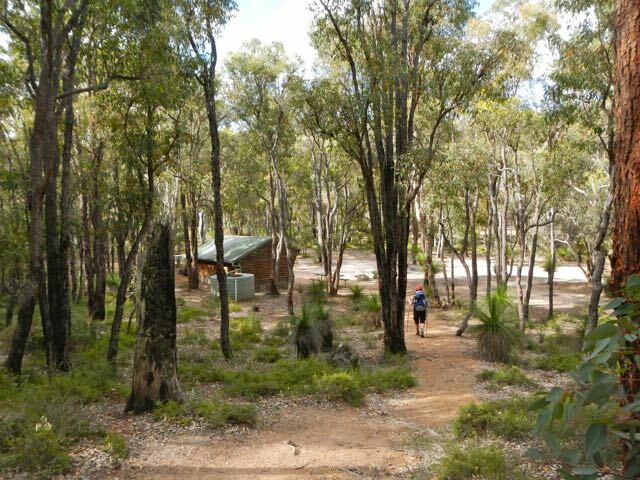 the Bibbulmun hiking track runs 960 beautiful forested kilometers from Perth to Albany on the south coast, studded with free sleeping huts for 8-15 people with camping sites, picnic table, fire pits, water tanks and dunnies (long drop toilets) every 10-20 km. 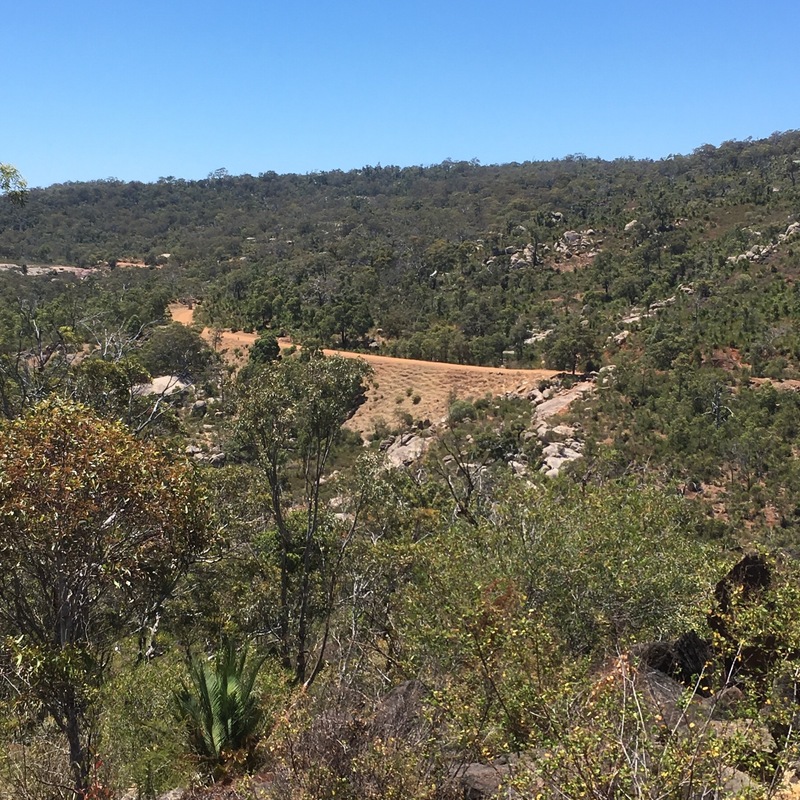 From an idea first mooted by bushwalker Geoff Schafer in 1972 the much developed and re-aligned route has been in it’s current form since 1998. Named after a group of the indigenous inhabitants, the Bibbulmun Nyoongar people, it recognizes their practice of walking long distances for ceremonial gatherings and seasonal migration, and is marked every 500m or so by a little yellow triangle depicting a Waugal, a rainbow serpent or water snake deity that in the dreamtime travelled through the Australian southwest creating the hills, rivers and lakes. During it’s long meandering passage south from Perth the track takes you through the seemingly endless Jarrah, Marri, Tingle and Karri forests of the Darling Plateau, wends it’s way through wetlands and creeks under the paperbarks, flooded gums and swamp banksia and emerges onto the lowlands of a coastal plain of sand dunes, limestone and granite cliffs and headlands for the final leg along the seaside to Albany, through the heath like Kwongan, one of the worlds most diverse types of vegetation. 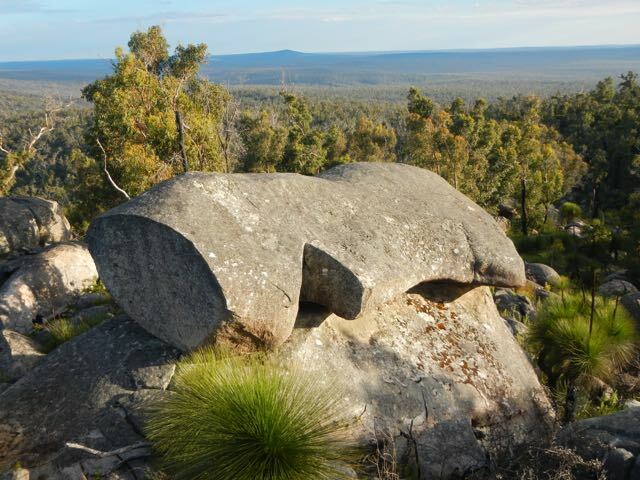 Now recognized as W.A’s leading example of eco-tourism, virtually the entire length of the Bibbulmun is in a conservation zone of some kind. With an ethos of minimum impact and “pack it in pack it out” , the complete absence of any rubbish is a testament to the 1000’s of walkers and a welcome change from some european routes. 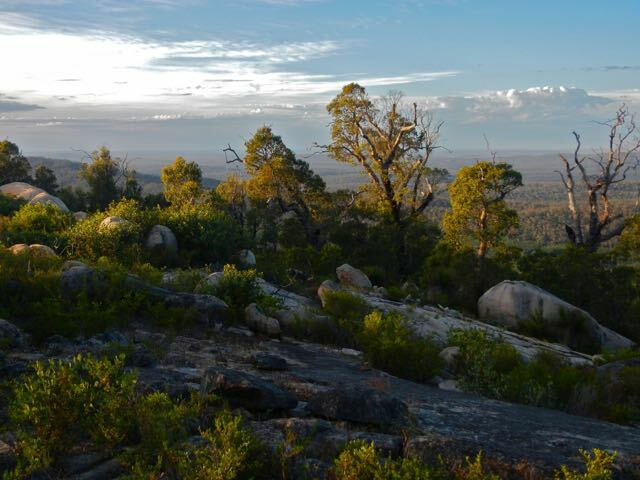 It was originally conceived as a way of encouraging people to “go bush” and discover the natural wonders of Australia’s southwest and is now managed by the Dept of Environment and Conservation with huge support from the volunteers of the Bibbulmun Track Foundation. 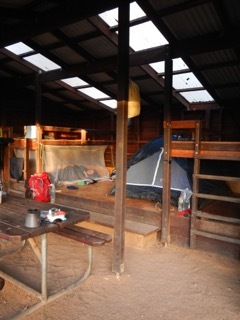 The Dept of Justice provided work crews from prisons to develop the track and build the huts and campsite facilities, which was deemed a great success for both the project and the prisoners, whose declining rate of recidivism was seen as proof of the significant boost in their self esteem engendered by the positive and constructive work on the trail. 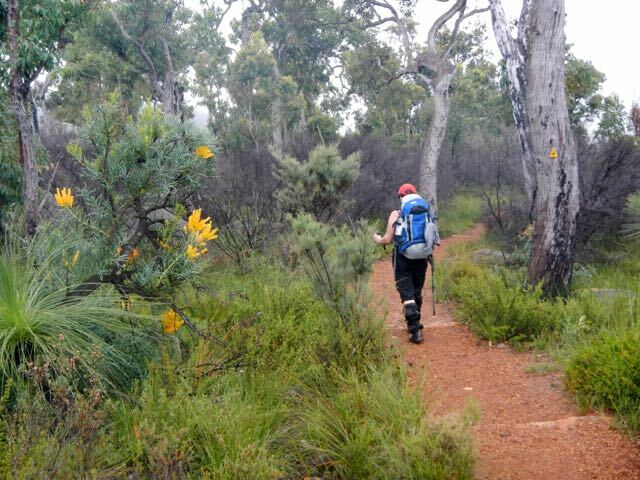 Although every year many hikers undertake 2 month long end to end treks, the majority of track users are walking for a few days at a time and some for just a few hours. trail, ferry you and your gear, and supply a guide if wanted.
. 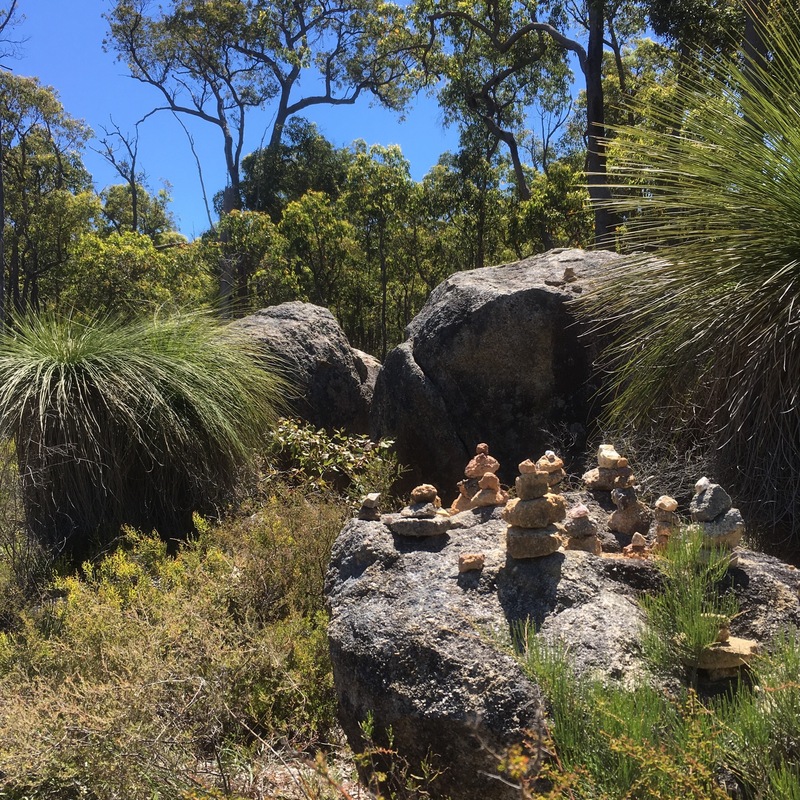 In Perth last December, with 10 days available to us, we set off to hike 2oo km down to the first town on the trail, Dwellingup. We had organised a couple of food drops at road crossings after 3 and 7 days to cut down on bulk in our packs but carried a tent as well as our bedding, cooking gear, clothes, mozzy net and water. As it turned out we had the huts to ourselves and didn’t need the tent but at other times of the year the trail can get busy with up to 20-30 people at the camps at night. 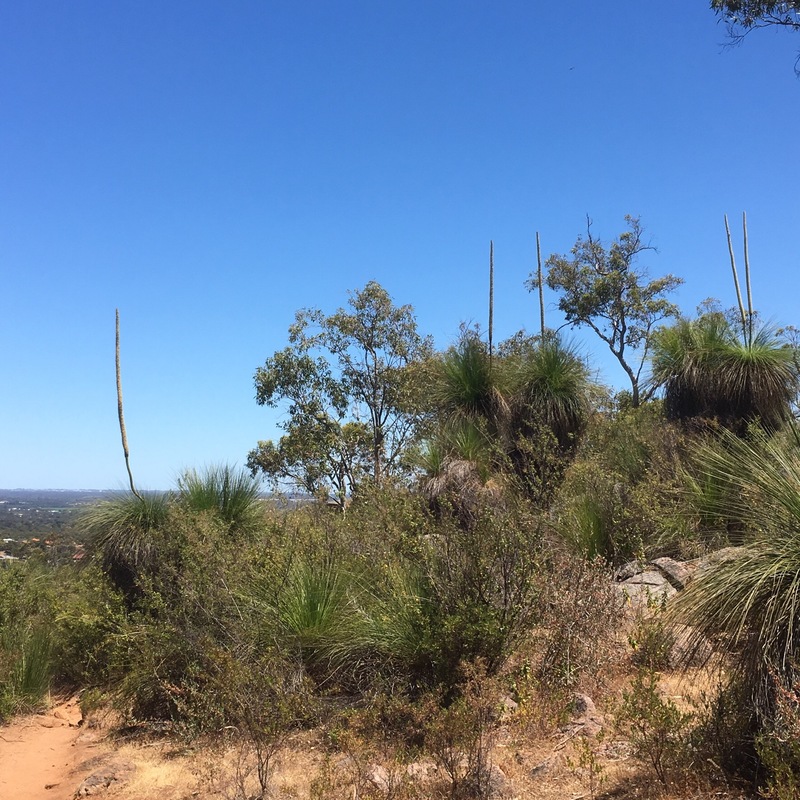 The summer temperatures were rising and although the forested route gives plenty of shade it seemed prudent to rise with the sun at 5 ish and walk in the cool of the morning, if necessary holing up somewhere for a few hours midday. 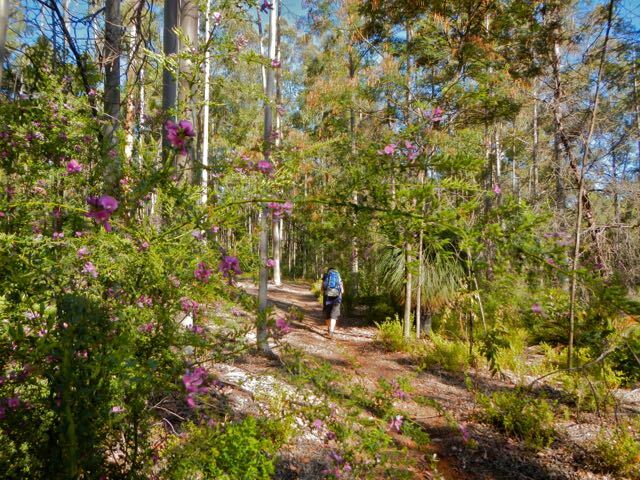 The noisy dawn chorus of squawking birds ensured we were up early and after tea and breakfast we would “pack up” and hit the trail through the awakening forest in glorious soft side light on a tide of earthy aromas rising in the growing warmth. 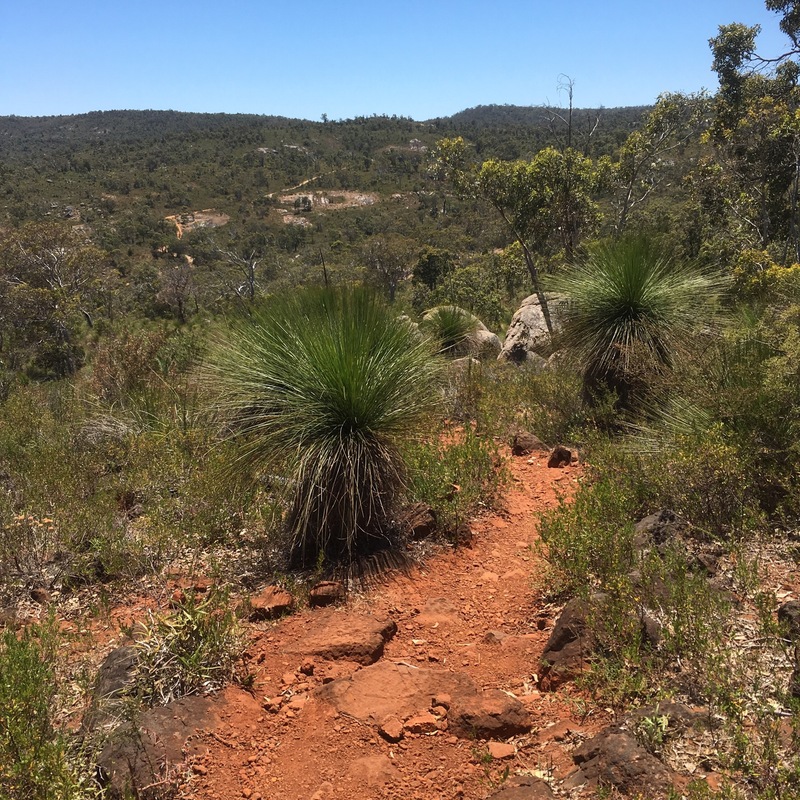 The trail surface is usually a soft and forgiving narrow path, occasionally veering onto old 4WD tracks of red pea gravel weathered down from the Darling Range granites. These are the remains of the oldest rocks in the world and can make for some tricky descents when it can seem like you’re hiking on ball bearings. 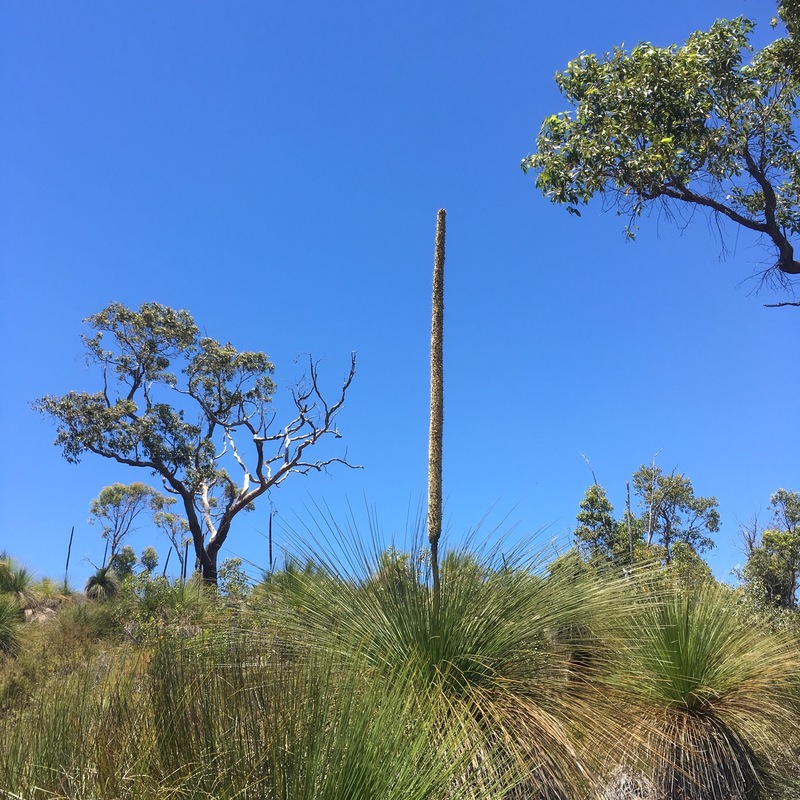 You’re very likely to see kangaroo and wallaby in the morning and evening and at night your torch may pick out a possum or echidna, a hedgehog like creature with a long thin snout. A huge 3,500,000 hectare feral fox eradication program, involving dropping 1000’s of poison baits from planes has enabled threatened native species, which are unaffected by the poison, to become re-established and so you may have a night time visit from a “back from the brink” quenda or bandicoot. You’re likely to see a lot more emu poo than emu, which may be just as well, as the males, if minding chicks, can become aggressive. 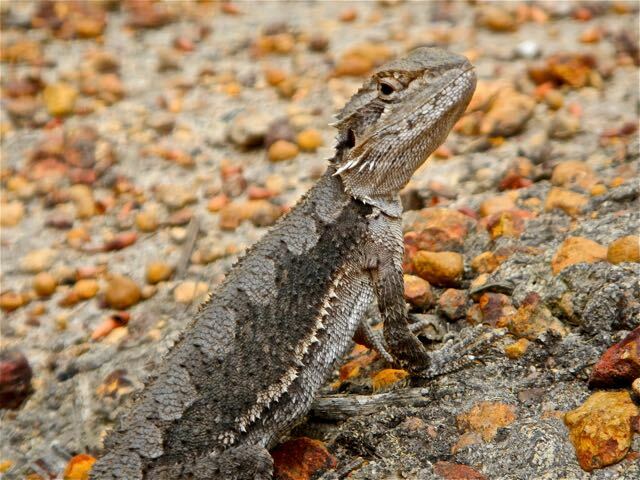 In the warmer months you could cross paths with lizards, snakes and skinks although they will probably hear you coming and beat a hasty retreat. 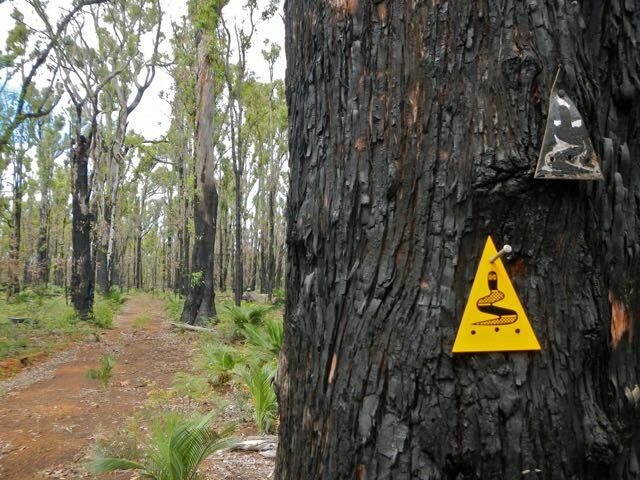 A sensible precaution against snakes is always to wear boots and trousers or gaiters. The most likely pests to encounter are the smallest. The march fly has a bite like a Horse fly and are satisfyingly slow to escape revenge. Midges, sandflies, ticks and mosquitoes can also be a nuisance best avoided by insect repellant and a net at night, which can also give security to anyone with arachnophobia. We had lots of webs of the strange horny christmas spider across the path, which although harmless were unpleasant on the face and necessitated waving our walking poles ahead of us. We knew we had become hardened when, after a week on the trail, we could be blasé about sharing a dunny with a redback spider. “Track fit” is a phrase to describe a body and mind comfortable with a long days backpacking on the trail and we felt ourselves gaining this status as the days rolled by one step at a time. unbroken greenery it was hard to imagine the vast deserts beyond. 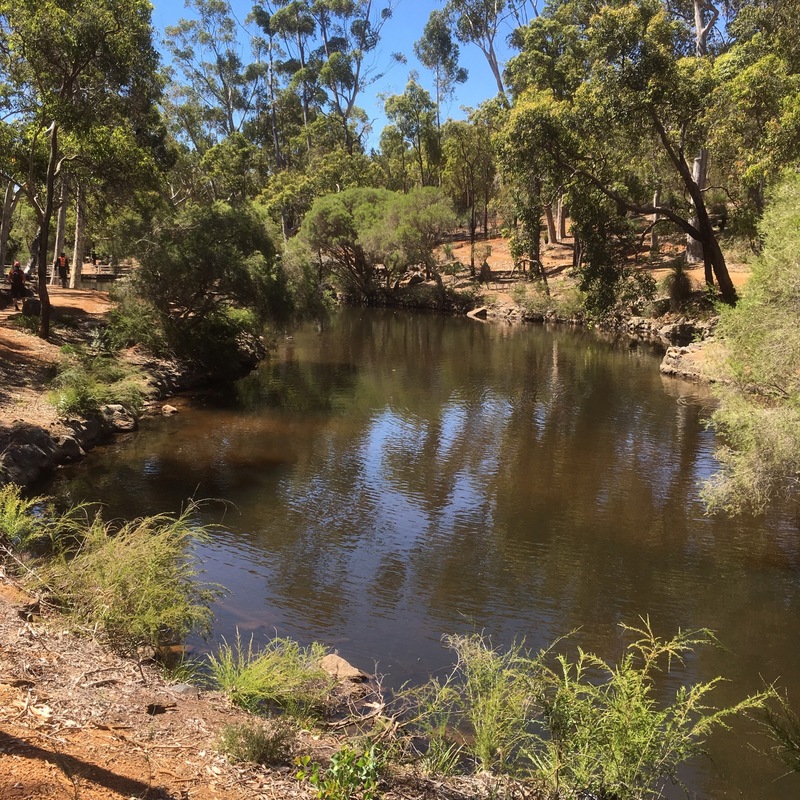 For the first 100 km from Perth the huts are roughly every 10km allowing for either nice easy days or, as we did, double or even triple hutting- stopping for a rest, some food, signing the trail register and carrying on. 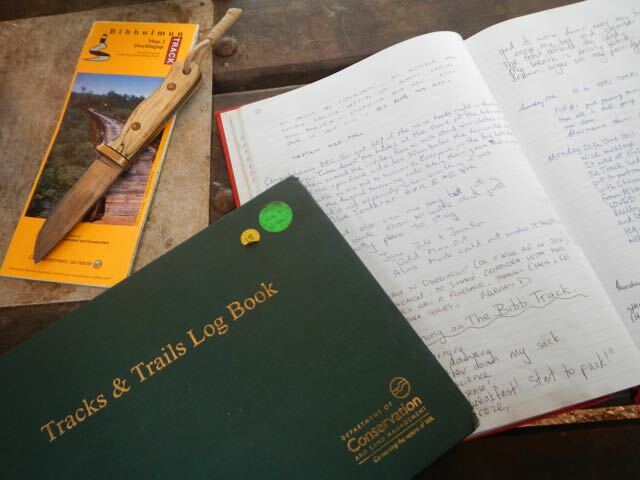 Whilst at the huts, the register with details of age, nationality, start and finish points etc and the accompanying log book for longer entries made for a great evenings entertainment. Reading the comments (and ages) of past end2enders was inspirational as were the reports of the common struggles of those with more lowly objectives. It was heartening to read of the school classes and other groups of youngsters experiencing “the great outdoors”- sometimes with 18 kg packs ! It seemed that outdoor education featured quite strongly in the school curriculum. The secondary school “journey or expedition”courses include skills and knowledge important to outdoor pursuits, minimum impact practices and reading the weather as well as personal and organization skills, group dynamics, first aid, risk management and leadership. How many of our students, or parents for that matter, would see a place for a long hard trek and sharing a dunny with a poisonous spider on the school syllabus? More entertainment was supplied in the logs by following the comments of some of the track regulars with trail names such as “The Mad Axeman”, “BigFoot” and “Pack Animal”. They seem to virtually live on the track, doing one E2E after another and bestow their wisdom upon lesser hikers. Pack Animal, who I believe holds the E2E record at 18, gives his address as ℅ Bibbulmun Track and plans to get a Waugal tattooed on the sole of his foot ! For the second 100 km stretch we were more conditioned for the longer distances between huts although the last few Km of the day were always the longest and the sight of the hut was a great relief. Time for a brew of tea- off with the boots- fill in and read the register-a rest before cooking the nights dehydrated dinner- a slow meander around the campsite gazing at the flora and fauna in the dappled evening light and then, as the sky grew dark- the birds settled down and the stars come out, we climb into our mossie net, lie down on our mats and after a short read fall into a tired but satisfied sleep by 9- ready to be up at 5 to do the whole glorious thing all over again. 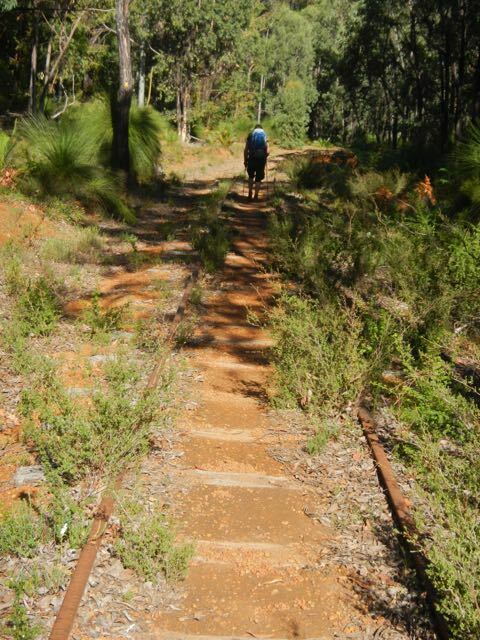 It was with schizophrenic feelings of pleasure and satisfaction but also sadness and loss that we walked into Dwellingup’s Information Centre to sign off the track after our last mornings walk of 20 km. 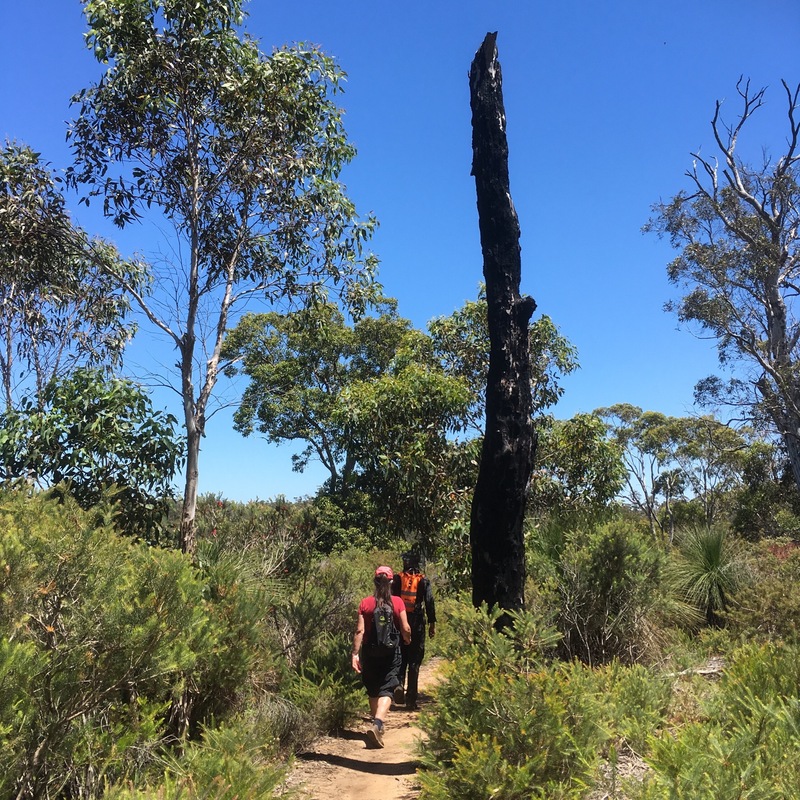 The town, whose history and fortune is inextricably tied to the forests surrounding it was devastated by a wild bushfire in 1961. 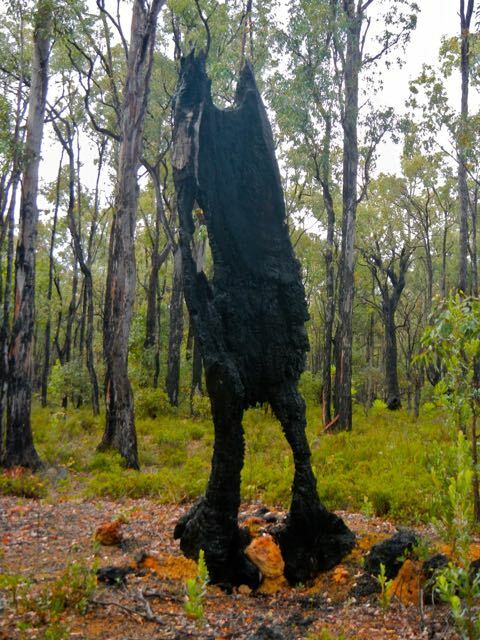 Since then a programme of controlled burning to remove fuel from the forest floor has helped to ensure against a repeat disaster and is a throwback to the fire based management techniques practiced by theAboriginal people for thousands of years. The only buildings to survive the ’61 fire were the nursing and post offices and the Community Hotel, recently refurbished, where we were looked after by English ex- pat John and his wife Andrea, supplying us with cold beer, fish and chips, shower, a soft bed and even washed our malodorous clothes in their washing machine. All of which was fantastic- but wouldn’t have been half as nice if we hadn’t hiked 200 km of the Bibbulmum Track to get them. 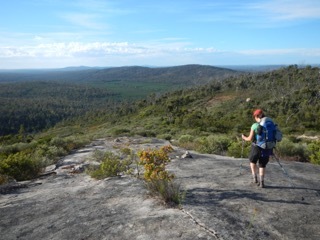 I can’t imagine how good the beer will be in Albany when I get around to hiking the other 750 km.